While I certainly understand and support the need for kids to enjoy a summer break from schoolwork, for many children some math work over the summer is helpful; perhaps even needful or essential. Yet different families' situations, abilities, and resources vary a lot. In this article I go over some common scenarios and suggest ideas on how to either review or relearn math over the summer. First, you should decide the general amount of math work needed. Ask yourself: how did your child or student do in math in the past year? Will he or she need a lot of review/instruction, or only a little review, or none? See a longer list of math assessment resources here. Your child did great and does not need review. You want to give your child some review so he doesn't forget what he learned. You want to prepare your child to the next grade. Your child needs intensive work in some or many areas. Great! Enjoy the summer! Or, you could use the summer to explore some interesting math topics outside the curriculum. Buy or get from library one of the many math readers — story books that have math topics weaved into them (Penrose the Mathematical Cat for example). Maybe surf into one of the interactive and/or fun math websites. Or, spend time with brain teasers, puzzles and solving interesting problems. These will help develop logical thinking, which will help with math. Online math practice programs such as IXL are very useful. They allow your child to practice unlimited math problems and give you detailed reports. Typically, you pay $10-15 per month, which is quite reasonable if you are only doing it for 1-2 months over the summer. I have authored Review Workbooks for grades 1-6 that provide a comprehensive review of a specific grade level of math, and include both topical and spiral review worksheets. They are available as inexpensive downloads ($5.50 apiece) or as printed books ($10.50 apiece). Additionally, Problem of the week programs can be an excellent solution since they usually involve a little more challenging word problems than what school books typically have. However, some of them don't operate over the summer. Here is a zero-cost solution: Get your student's last year's math book, or go to library to get a few math books for the grade he just finished. They can even be from the 1980s; it won't matter too much. Just get a book that contains review and/or test pages at the end of the each chapter. Then, every once in a while just let your child work through those review pages in the book. You could get a few math books from the library for the upcoming grade and check what topics are coming up. The ideas above (in point B) are also useful. However, for the most part, it is enough to have mastery of previous year's topics in order to be prepared for the next. Your child needs intensive work and filling in gaps in many areas. Depending on your budget, there are many options. 1) IXL subscriptions provide access to all grade levels, so your child can practice below grade level to help catch up on concepts they're not getting. At $9.95/mo, this is an inexpensive option for summer practice. 2) One-on-one tutoring programs and summer schools. These take the burden of teaching off your shoulders. Do a Google search on "online math tutoring summer program" to find some. Prices are in hundreds of dollars ($200 or more). 3) There exist MANY online math curricula. Paying the subscription fee for two months for a complete online curricula can be quite worthwhile and allow a lot of learning to happen in that time. Fees for those are $10-$50 per month. 4) Teach it yourself. Please read my article how to help a student who is behind for a more complete plan and suggestions. What materials should you use for an intensive catch-up? There exist SO many math books, curricula, videos, and so on... The choices are too numerous to even make a list. 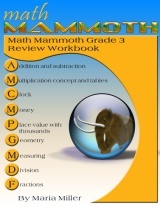 An inexpensive solution is to use Math Mammoth Blue Series workbooks. They are TOPICAL books, and are an excellent solution for reviewing a few concepts or topics over the summer. These books are available both as downloads and printed copies, and are very affordable as downloads (prices range from $2 to $7 per book). What about about math facts? Don't rely on flash cards alone. They take math facts out of context, and isolated "out of context" facts about anything are always hard to learn for anybody. Always show the students FIRST the patterns in the facts and various strategies and tricks to learn them, whether it be addition or multiplication facts. Only later add in random drills. Subtraction and division should be taught as "backwards" addition or multiplication, not as separate sets of facts. The video below lists several strategies for addition facts (for first and second grade math). I show the pattern of "Sums with 7", which also is used with other sums, then the 9-trick, the 8-trick, the doubles, doubles plus one more, and how to do random drill using the structure of the addition table. Here is another video about strategies for subtraction facts. I recommend the usage of FACT FAMILIES in order to learn the basic subtraction facts. That way, when children have a subtraction problem, such as 7 − 5 = ____, they will learn to think through addition and fact families: 5 and 2 and 7 form a fact family, OR that 5 + 2 = 7, so 7 − 5 = 2. The video also shows a fun tool for subtraction facts called number rainbows! I hope this article is of help in giving you ideas for summer math!